Benedict Cumberbatch, In Transition is available from all good bookstores including in the USA Amazon, Barnes and Noble, in the UK Amazon, Waterstones, and for everywhere else Book Depository who offer free worldwide delivery. In ebook format there is Kindle, iPad, Kobo and Nook. The Immortals: An Unauthorized guide to Sherlock and Elementary is available from all good bookstores including Amazon USA, Amazon UK, Waterstones UK, and for free shipping worldwide Book Depository . In ebook format it is in Amazon Kindle, Kobo, Nook and Apple iBooks (iPad/iPhone). 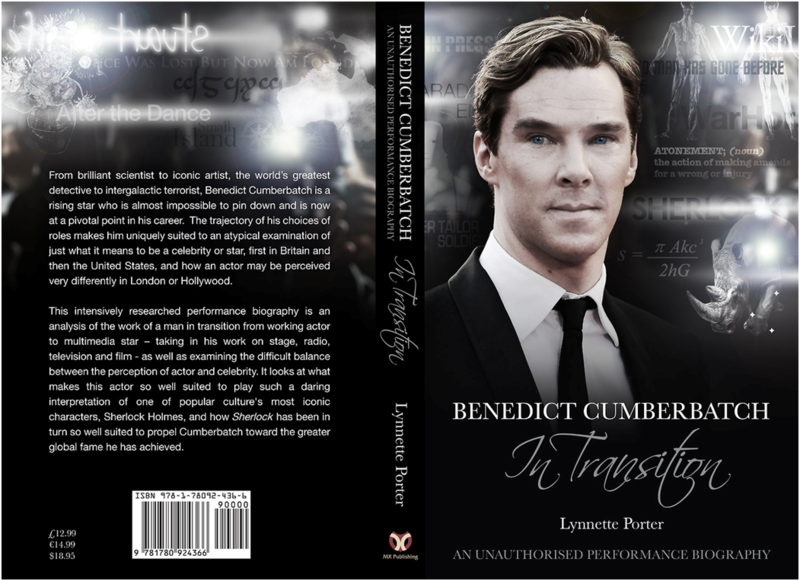 “Written by Lynnette Porter and published by MX Publishing, Benedict Cumberbatch – In Transition: An Unauthorised Performance Biography is no ordinary biography as we know it from most other celebrity biographies. The author focuses almost entirely on the career of Benedict and gives an overview of his projects, backed by numerous quotations and anecdotes. This week sees the launch of a must have book for all BBC Sherlock and Elementary fans. ‘The Immortals’ is a comprehensive episode by episode review of the two series by Holmes expert Matthew Elliott. His unique approach tackles each episode and links back elements to the original stories, reviews plotlines, characters and good and bad points. Matthew Elliott is one of the leading Holmes experts in the UK – regularly publishing articles and speaking at major Holmes events. In fact, he was the host for the 7th November Sherlock Holmes Society of London film evening. So whether you are a fan of either or both series, or in fact a detractor, you will find Elliott’s analysis of the series compelling reading. The Immortals: An Unauthorized guide to Sherlock and Elementary is available from all good bookstores including Amazon USA, Amazon UK, Waterstones UK, and for free shipping worldwide Book Depository . In ebook format it is in Amazon Kindle, Kobo and Apple iBooks (iPad/iPhone). The reaction to the short stories gave us the confidence to include in the launch a special hardback. Finally, this week sees a fantastic free event for Sherlock Holmes fans on Friday 8thNovember, 7pm at the Park Plaza Sherlock Holmes Hotel. The launch of ‘The Immortals’ a comprehensive review of the BBC Sherlock and CBS Elementary series from Holmes expert Matthew Elliott – free tickets available from http://theimmortals-efbevent.eventbrite.co.uk/. Watson Is Not An Idiot is available from all good bookstores including Amazon USA,Amazon UK, Waterstones UK, and for free shipping worldwide Book Depository . In ebook format it is in Amazon Kindle, Kobo, Nook and Apple iBooks (iPad/iPhone). 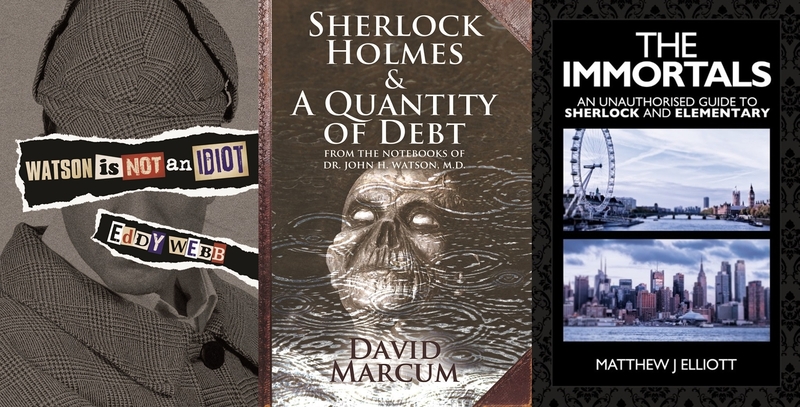 Sherlock Holmes and A Quantity of Debt is available from all good bookstores including Amazon USA, Amazon UK, Waterstones UK, and for free shipping worldwide Book Depository. In ebook format it is in Amazon Kindle, Kobo and Apple iBooks (iPad/iPhone). The Immortals: An Unauthorized guide to Sherlock and Elementary is available from all good bookstores including Amazon USA, Amazon UK, Waterstones UK, and for free shipping worldwide Book Depository . In ebook format it is in Amazon Kindle. “When I was a young teenager, I was utterly besotted with Prince William. What can I say? While my friends were eagerly snapping up magazines featuring N’Sync and the Backstreet Boys, I bought a short and fairly abysmal unauthorised biography of the royal heir. I didn’t care; it was something. Thankfully, Benedict Cumberbatch fans of any age no longer have to face the indignity of wasting money on shoddy prose. Benedict Cumberbatch, In Transition is an exhaustively-annotated and impressively-detailed account of a young actor’s career. Some might ask if now is the time for such a book, releasing arguably nearer the beginning of his acting career than the end; however, the transitional aspect gives the tome much of its interest. Porter purposefully sought to chronicle the rise of an actor who is only just beginning to reach the heights many expect him to continue to scale. It’s important to note that since the book is unauthorised, the information is gleaned from other sources. The value of such a book is the same as that of a very specific encyclopedia–it presents a host of information that most fans would be unable or unwilling to look up for themselves. Whether or not Cumberbatch is as successful in the future as the author and many in the media and wider fandom expect, this book will continue to serve as an interesting signpost at the crossroads of a person’s life. Even those who have followed Benedict for some time will likely find new details to savor. Benedict Cumberbatch, In Transition is available from all good bookstores including in the USA Amazon, Barnes and Noble, in the UK Amazon, Waterstones, and for everywhere elseBook Depository who offer free worldwide delivery. In ebook format there is Kindle, iPad,Kobo and Nook. “Benedict Cumberbatch In Transition – An Unauthorised Biography. A Review. Can a simple title say it all? In this particular case, it can and it is a joy. Benedict’s career is indeed in transition at the present moment in time (when I’m writing we are just a few days ahead of the Star Trek Into Darkness Premiere in London) and, in less than four years,he has metamorphosed from a very talented BBC actor to a sought-after international star. If you expect a mere unauthorised biography here, you will be disappointed. As already thoroughly explained by Sherlockology and by the author herself in an interview with our page (see the link below), this book is an analytical and very detailed essay about his works. No matter if you are a “new-comer” or a long-term fan, you will find its contents intriguing. The book is certainly particularly appealing for its in-depth analysis of the “before Sherlock” career, focusing on Benedict’s theatre roles. Lynnette Porter has enriched each chapter with her own experiences and interviews obtained whilst going through theatre archives in London and meeting directors (using every possible source available); allowing the readers “to see” the performances through her eyes even if they haven’t actually seen them in reality. Praise must also be given for the unbiased approach to each project he has be involved in, both in the past and in the near future. Although it is undeniable that BBC Sherlock can be considered as a turning point in Benedict’s career, he is such an incredibly talented Thespian that each and every role he has portrayed has its own strength. In fact, it is always a source of great inspiration for fans and viewers to discover- through his own words – the reasons of his professional choices, the hard work to prepare for them and the efforts to avoid being typecast. Lynnette Porter is the author of 14 books, a cinema reviewer and university lecturer (as well as a devoted fan) and she embarked on this project with contagious enthusiasm and professionalism. MX Publishing is popular among Sherlockians for all its valuable Sherlock related titles to date. Benedict Cumberbatch In Transition will be released on 10th June.